This is my everyday outfit. It's an easy and comfortable look. Sometimes I keep it simple and other times I layer it with different prints and textures to make it unique. In my closet there are a few key pieces that I can never get enough of: dark wash jeans, striped shirts, button-ups, cargo jackets, flats, and neutral color handbags. I can mix and match these pieces with all of my clothes and feel stylish and current. Update: Check out my feature "1 Girl, 4 Looks" on Refinery 29 today! This is a really well balanced look. Perfectly casual yet feminine!! I love this comfy look :) esp when paired with the ballet gold pumps. 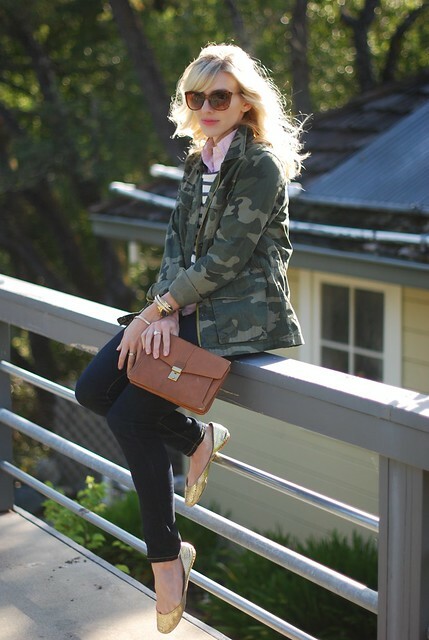 Your gold Steve Madden flats are darling! I love your everyday look. Comfy but chic! Stop by again soon! xoxo! i LOVE the clutch!! so simple and yet the perfect piece to add to an outfit!! I really do have a thing for stripes as well. 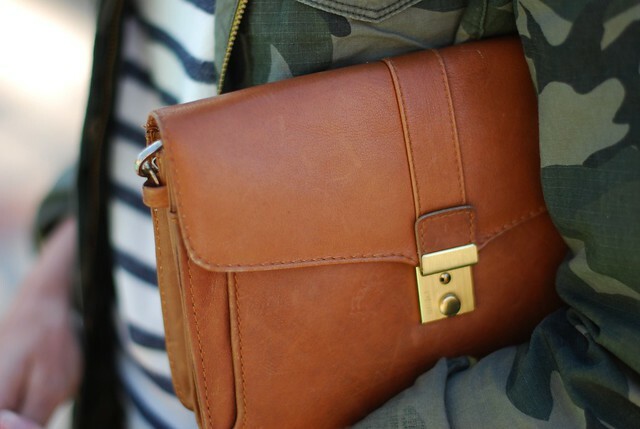 Love the clutch and how great it could go with just about everything. great look! the clutch is simply perfect!! That's a lovely, casual outfit. I love how the pink shirt plays peek-a-boo, adds a dainty touch! So simple but you still look fabulous! I love this look! I've been scouring the world for a jacket like that! How long a ago did you purchase it? a great everyday look simply but with the touch of glam a the same,perfect for everyday. 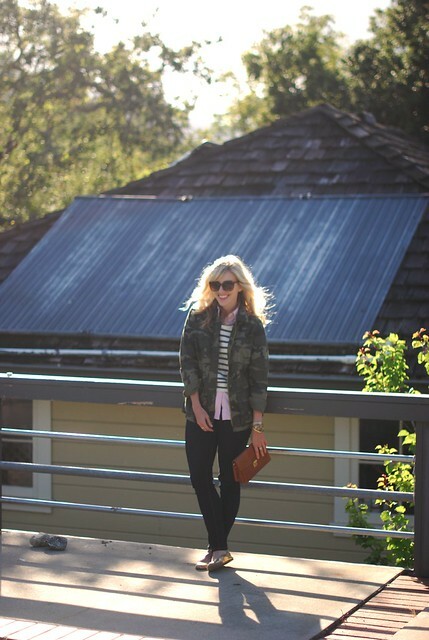 Great everday look consisting of a few of my favorite things: stripes, army green, and touches of gold. LOVE. Love this easy breezy outfit, so effortless yet so chic! Love this look from head to toe Taylor! You look so put together! Really love those sunnies too! Can't believe they are F21! love the mixture of layers and textures! I'm doing the same today, I love putting on my go-to pieces and jazzing them up with fun jewelry... especially on days like today when the weather is icky and I need to run errands! P.S. Love love love those sunglasses! Adore the outfit. Can't go wrong with something this chic and simple. i hope camouflage makes a true come back!! You really look so amazing in those shorts! Firstly, congrats on the R29 feature. that's awesome! Secondly, love this outfit! So comfy yet polished and perfect. You look beautiful!!! I love simple outfits. xo. Very cute! I'm actually wearing a similar outfit on my post today. I love how versatile stripes can be! I love the look of your stripes with the camo. Very unexpectedly chic! I love how the camo gives it a kind of tomboy feel. Love your style! This outfit is great. I love the way you've paired camo with strips. Unexpectedly fabulous!! so adorable!! LOVE the camo, pink and gold together. I really like the pop of gold in this look! You look GORGEOUS, Taylor -- I adore your clutch! Thanks everyone! You can't go wrong with stripes! I just wanna say I love this outfit. I must try something similar. I actually just won this jacket from my local Old Navy last week and I love it. 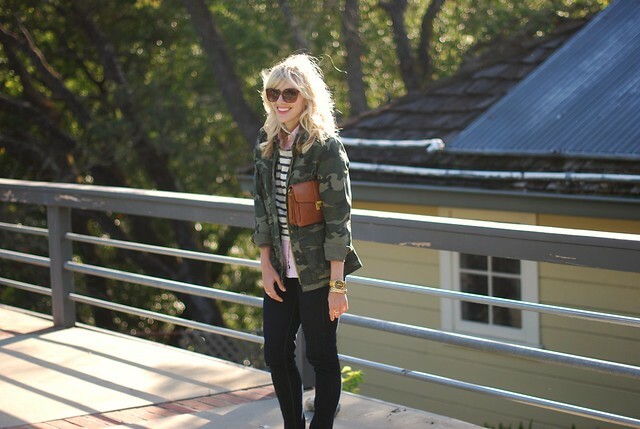 LOVE the camo jacket! What a find!! Great outfit! So simple and chic! Love the jacket!